There has been a lot of talk about streaks this past week with Brock Lesnar defeating the Undertaker. Last night the Detroit Red Wings lost to the Pittsburgh Penguins in a shoot out. Wings fans everywhere were celebrating the loss because that one point was all they needed to make the NHL playoffs. 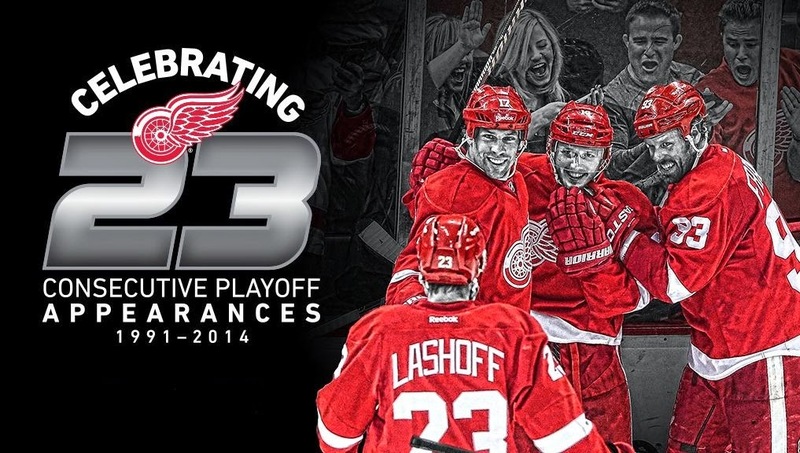 This will be Detroit’s 23 consecutive year in the playoffs, the longest active streak in professional sports. Detroit managed to tie the game with only 1:10 remaining on the clock. Overtime turned into a shoot out and the Penguins were given the win. In the NHL a team that loses via shoot out is awarded 1 point. That point was enough to clinch a Wild Card spot. Columbus also won their game last night so they will be taking the East’s second Wild Card spot. It’s very likely that Detroit will be facing Pittsburgh in the first round of the playoffs, so this will probably be the last time Detroit fans are celebrating a loss to the Penguins.